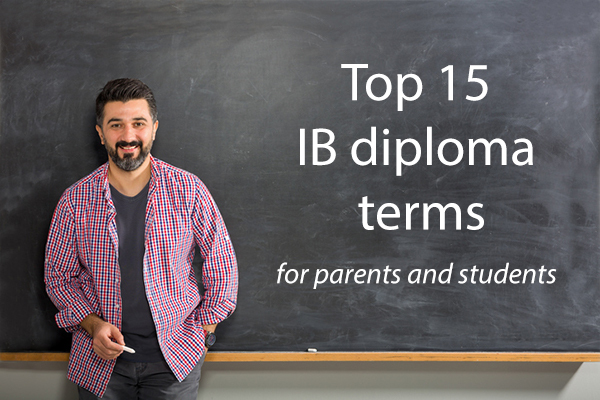 New to the IB Diploma Programme (DP)? We know that understanding this IB programme is important for parents and guardians who want to support their child throughout their studies. These fifteen terms will help you stay ahead of the curve. The IB diploma is a globally-recognized qualification awarded to students who fulfill all required components of the two-year IB Diploma Programme (DP). To receive the full IB diploma, students must 1) take three higher level (HL) and three standard level (SL) courses and exams, 2) complete the DP core requirements, and 3) be awarded a minimum total score of 24 out of 45 possible points. In addition to completing courses in six subject areas, full IB diploma candidates are required to complete the three core components: creativity, activity, service (CAS), the extended essay (EE), and theory of knowledge (TOK). For CAS, a student completes activities that allow their learning to extend beyond the classroom. Many students choose to fulfill CAS requirements through community service or athletics, but additional possibilities exist so long as the project includes one of the three categories: creativity, activity or service. Throughout CAS, students reflect on their experiences and explain how their activities help them achieve specific learning outcomes. The extended essay is a written research project of no more than 4000 words. Students choose their own topics and the completed essay is sent to IB moderators around the world for grading. For additional support, students typically select a mentor to help identify a topic and provide guidance while researching and writing. TOK is a course in which students discuss and examine the concept of knowledge– its worth, veracity, and forms. TOK requires DP students to submit an essay for external assessment. All IB Diploma Programme (DP) students participate in DP courses. The strength of the DP is the way in which learning is interconnected across individual subjects. Combined with the core requirements, DP courses are one part the DP’s holistic approach to teaching. However, schools may allow students to selectively complete IB courses and/or sit for individual exams rather than opt to complete the full IB diploma. In any given course, students will complete a subject’s coursework regardless of their status as a course student or a full diploma candidate. These assessments are graded by trained IB examiners. External assessments include the written IB exams taken by the student at the end of a DP course, normally in their second year of the Diploma Programme. In some courses, including film, the external assessment is a textual analysis. In visual arts, studio work is assessed. For an inside view on IB assessments, read this article. HL courses are taught over two years and include a rigorous study of the course material. These courses allow students to explore areas of interest within the subject in greater depth when compared to SL. SL courses ensure students are exposed to a range of disciplines that they might otherwise opt out of. These courses are designed to be taught over two-years, with some exceptions. SL exams are slightly shorter compared with HL exams. * HL and some SL exams, given to second-year students, may provide students with university credit or advanced standing with an individual grade of 6 or 7, and in some occasions with a 5 (see individual university websites to find out). IB exams, regardless of whether they are HL or SL, are graded between 1-7, with 1 being the lowest and 7 being the highest level. Many schools and universities describe IB exam levels as IB exam scores, however, each of the seven grade levels offer a detailed description of student performance and understanding. An IA is an individual assessment evaluated by the subject teacher with a list of criteria and is usually focused on some subject-related work. Alongside the criteria, samples of the student’s work (oral performances, portfolios, lab reports, and essays) are also submitted to the IB. These are course-specific expectations or criteria for performance evaluation used by the teacher. They exist in every subject to aid in the grading of IAs. This is the process of evaluation for internal assessments (IA’s) used by an appointed IB assessor. Moderation ensures that the IB’s reliable global standards are maintained at all IB World Schools. The IB learner profile is a list of traits that the IB wishes to nurture in its students. These traits are centred around international-mindedness, inquiry, and reflection. For a complete list of learner profile traits click here. These are submitted scores that teachers believe each student will achieve on their DP exam in a given subject.